After a star-studded revival of Tom Stoppard’s Rosencrantz and Guildenstern Are Dead, the Old Vic Theatre hosts the world premiere of new musical Girl From the North Country, as part of Matthew Warchus’ second season as Artistic Director. Featuring classic songs from the back catalogue of legendary musician Bob Dylan, Girl From the North Country plays a strictly limited season at the London venue, beginning in July 2017. Casting includes stage and screen actor Ciaran Hinds (Rome, The Woman in Black) as Nick Laine, Shirley Henderson (Bridget Jones, Happy Valley) as Elizabeth Laine and Sam Reid (The Riot Club) as Gene Laine. Further cast members include Ron Cook, Debbie Kurup, Arinzé Kene, Bronagh Gallagher and Jim Norton, as well as Sheila Atim, Claudia Jolly, Kirsty Malpass, Tom Peters, Karl Queensborough, Michael Shaeffer, Jack Shalloo and Stanley Townsend. 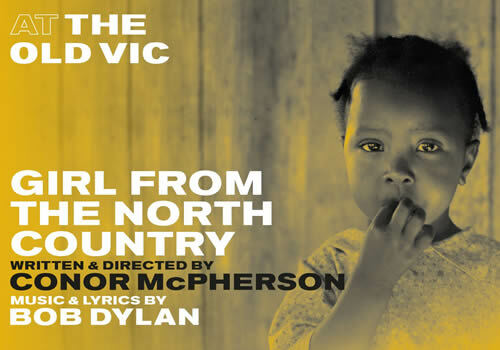 Written and directed by esteemed playwright Conor McPherson (The Weir), the musical has gained permission from folk icon Bob Dylan to stage his songs, making the premiere of Girl From the North Country one of the most highly-anticipated productions of the season. Playing at the Old Vic London, this electrifying new musical runs from July 12th to October 7th 2017. Girl From the North Country contains strong language and adult themes which may not be suitable for young children.